This week, Baby A will reach another milestone. She will clock up one whole year since she got her hearing aids. It's been such a huge year for our family, with countless appointments (audiology, ENT, hearing tests) and hours upon hours upon hours of auditory-verbal therapy, where she learns to listen and speak with her hearing aids. I've spent heaps of time over the last year trying to find resources to help Baby A learn to listen and speak. Most parents of deaf and hearing impaired children will be familiar with the Ling Sounds, which are seven sounds across the main speech frequencies that you can use to check that your child is hearing (even small babies respond to these sounds). We practice the Ling Sounds most days. From a practical point of view Baby A's responses let us know whether her hearing aids are working, and it's also been really lovely to watch her move from detecting to identifying and now imitating those sounds. A's Ling Sounds book. The cover illustration is based on her. 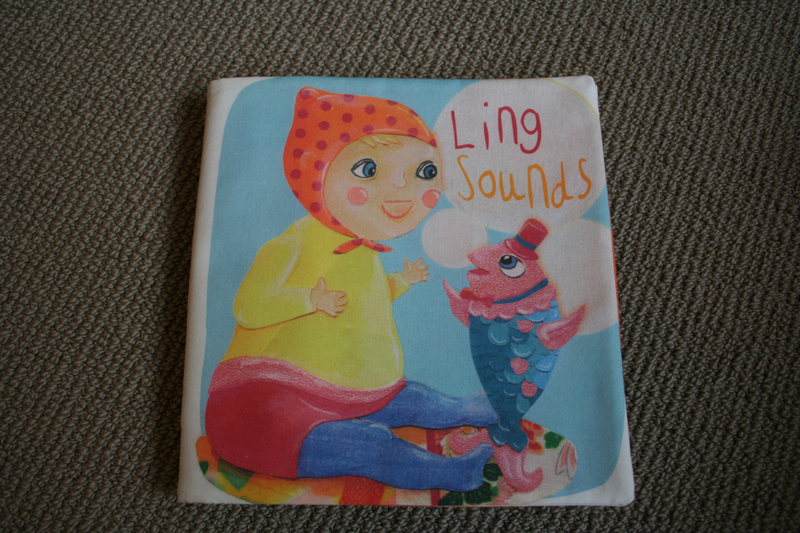 I decided to make Baby A some cards with the Ling Sounds and a picture to represent each sound, to keep her interested in them. 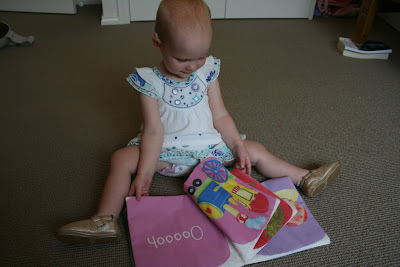 Before too long that idea had merged with my love of all things crafty and morphed into creating a cloth book. I'm very lucky to have an extremely talented sister-in-law, who is an illustrator. She managed to turn my ideas into the most beautiful, colourful illustrations. I used spoonflower to print the fabric, then sewed it up into a book. I'm thrilled with the result, and so is Baby A. She never seems to tire of it. I made a couple of prototypes, but settled on this oversized version. It uses a whole yard of fabric, but is great for little hands. Baby A is doing so well - I wish I had a crystal ball a year ago. Her 'listening age' is 12 months - which means she has had access to sound for 12 months. This puts her behind other children her age, who have had 17 months of access to sound, plus a good few months in utero. 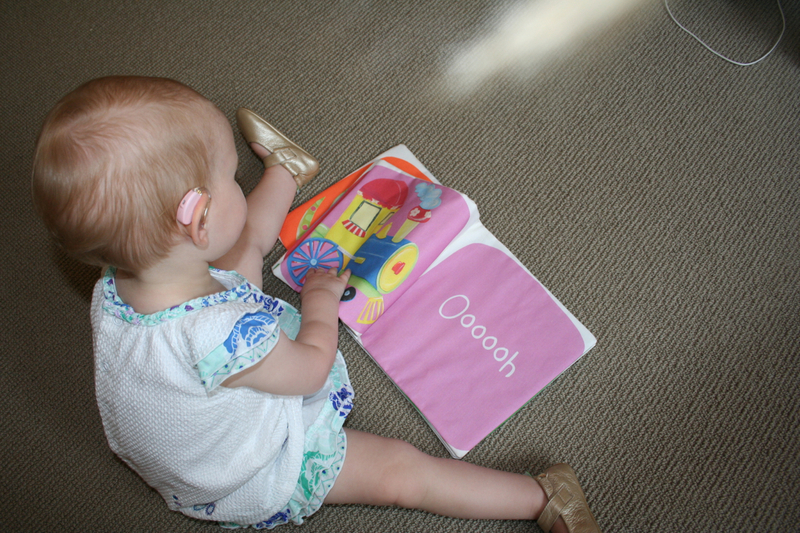 The average (non hearing impaired) 17 month old has around 15 words. Baby A has a vocab of nearly 70 words. I'm so proud of her. She has come such a long way in such a short time and her hearing impairment hasn't held her back at all. 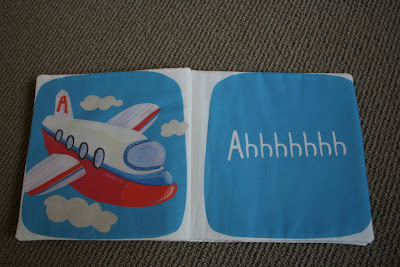 My sister-in-law included so many beautiful details in the illustrations, including this A for baby A on the plane's tail. If you ever market the fabric I would love to purchase it. What a special book! And I'm really pleased to hear that she's doing so well. I'm so proud of A and the progress she has made. You're a fabulous mother, Claire! 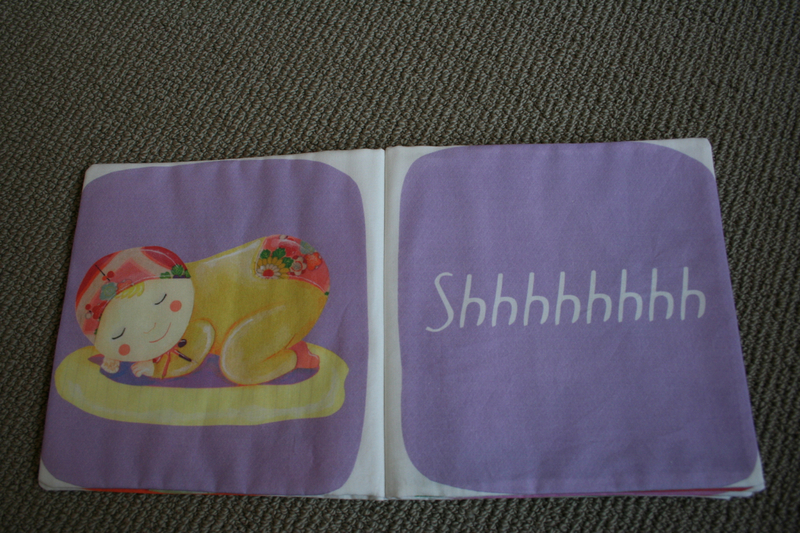 The book is darling, your SIL is a very talented illustrator. How wonderful! Thanks for sharing this, Claire. I work for the Royal Institute of Deaf and Blind Children in Australia and I just love your idea. I'm going to try and make something similar (wish me luck) for our babies. Thank you for the inspiration and so glad this child is doing well! !